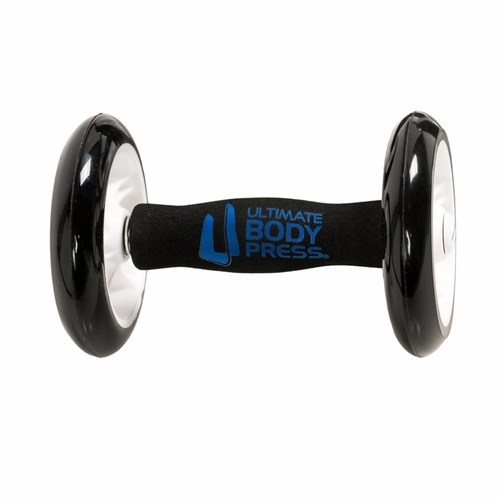 Abs Wheels from Ultimate Body Press get better abdominal results faster than doing crunches. Our affordable and easy to use Ab Wheels offer a huge range of rewarding exercises and are one of the most effective abdominal and upper body training tools available. The Ultimate Body Press Ab Wheels feature foam non-slip grips for added comfort and smooth-rolling ball-bearings for outstanding durability and lasting performance. The Ab Wheels from Ultimate body Press actively target the muscles in your lower abdomen which are notoriously difficult to train using traditional exercises. Ab Wheels are suitable for beginners or experienced users alike. 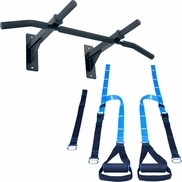 In addition to being a powerful abdominal training tool, they are an advanced pushup device that not only train your abs, but also your chest, back and shoulders. 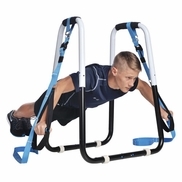 Ultimate Body Press Ab Wheels are a proven device for rapidly removing excess stomach fat, toning abs to reveal an impressive six pack, and improving overall performance quicker than you ever thought possible! 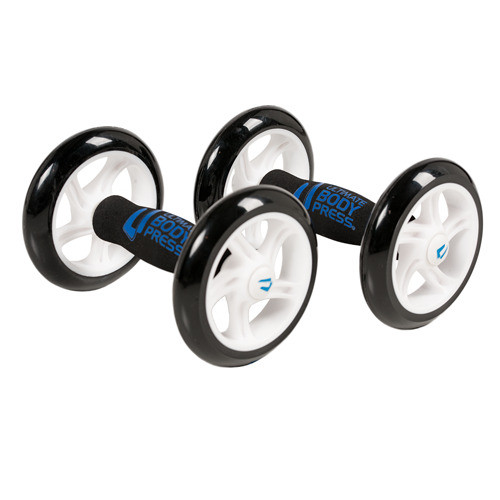 For fast and striking results, we recommend that you make our high quality, light, and portable Ab Wheels an integral feature of your workout. Ab Wheels (Black)5TomSeptember 7, 2013Solid construction, very smooth and quiet. What I'd like to see are ab wheels like this that come as weights too then you could use them for more arm workouts. Start with 5 lbs and go up to 25 lbs in 5 lbs. increments. Ab Wheels (Black)5Shannon Tyrrel IslandMarch 21, 2013When I first ordered this product, I looked at it as a nice accessory to add a little variety to my workouts. 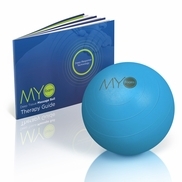 Now, I think of it as a valuable and essential tool to reach my fitness goals. This variation of the original design blows all the others before it out of the water. There's so much more you can do with an ab wheel for each hand than you can with just one wheel for both hands. And it's much more challenging. Ab Wheels (Black)5HeatherOctober 24, 2012I just received them and am excited to start using them. Ab Wheels (Black)5RichardAugust 10, 2012Well built & does what it is supposed to do. Even more important, their Customer Service is first rate. Ab Wheels (Black)5zack beacleayJune 8, 2012best product i have bought in a long time. very well build, so much better than one single wheel. 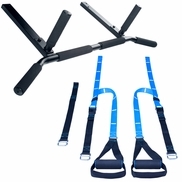 they are great for your abs and i even use them for push-ups, makes it very unstable and you get alot more out of you work-out. Ab Wheels (Black)5George ReeceApril 12, 2012The ab wheel allows me to perform different exercises by using either arm or both at the same time. It provides extra options that you do not get with the power wheel. For example, one arm roll outs, chest flys, etc. I am very happy with my purchase. Question: using the ab wheel,is it a good way to get the "apollo's" belt? Answer: You can do roll-outs. I would also recommend lower body exercises like squats. Question: How do these compare to AKROwheels? I have tried AKROwheels at my local gym and they work great. Please be honest. AKROwheels are sold everywhere I have looked so I want to find the next best (if not better) product. Thanks. Answer: These are very comparable. We encourage you to purchase. If are not happy with them you can return them for a full refund including shipping. Question: What exercises are possible with these other than roll outs? Answer: The ab wheels are useful for a variety of core and upper-body exercises. Question: I can't find the ab wheels on the Europe site. Are they available - I live in Ireland. Question: How much is shipping to 67212? Question: What are the shipping charges to 67212? Question: What is the diameter of the wheels? What is the length of the handle? What is the maximum weight one wheel can take? Can they be used on concrete? Answer: The ab wheels can be used on concrete. These ab wheels can hold up to 300 lbs. The center axles are steel and the wheels, which are very similar to roller blade wheels, are pretty much indestructible. Diameter 5" length 6". Question: Do you hae any idea regarding the weight capacity of this product? I weigh about 210#, and I want to use it for chest fly rollouts - do you think it will hold up,or not? Answer: These ab wheels can hold up to 300 lbs. The center axles are steel and the wheels, which are very similar to roller blade wheels, are pretty much indestructible. Question: How much do they weight, together? Question: What is the dimensions of the product? The diamater of the wheel? Answer: This item is not stocked in our UK warehouse. If you would like to purchase this item for special delivery from the US, please use our "Contact us" page to get a quote. 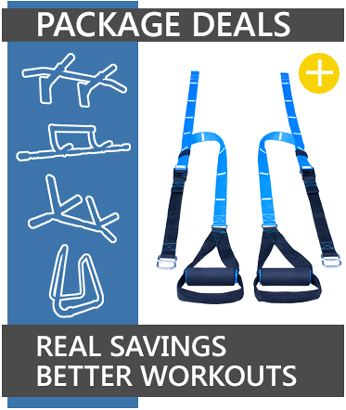 http://ultimatebodypress.com/contact.html and our Customer Service Department will help you with your order by email. Question: Please tell me the diameter of the wheels and the overall length (or width to the outside of the wheels). Also, are usage instructions included in either written or electronic (i.e., dvd) format? Thanks. 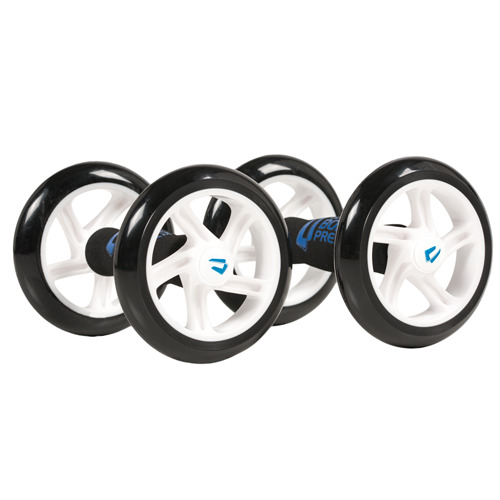 Answer: The wheels have a 5.5 inch diameter and the overall length is 8 inches. Question: P. S. How long will this price be in effect? or is it a permanent sale price? Answer: The price is subject to change at anytime. Question: How much is the shipping to Staten Island New York 10307 ? Answer: These ab wheels are comparable in size to the Akrowheels. To date we have not received one complaint of the Ultimate Body Press Ab Wheels breaking. Question: Are there any exercise routines included with the Ab Wheels? Question: can you ship to uk? costs total? Answer: This product is not available in stores at this time. Answer: we will have more in stock by Jan 1. Question: do you get two wheels per order? Answer: Yes, these are sold in pairs.